Lead Mammographer Amanda Valderez RT (R)(M) guides her patient through the 3D mammography process. 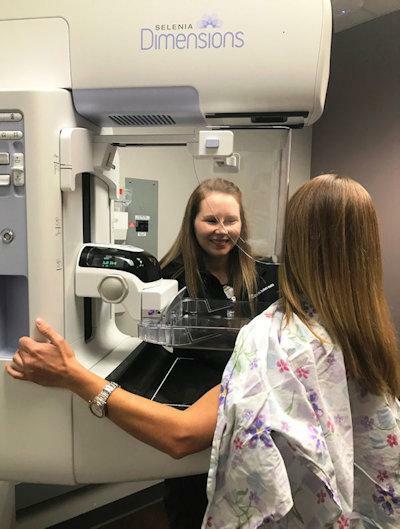 3D Mammography Technology Now Available in Livingston, LIVINGSTON, August 2, 2017 - Committed to the fight against breast cancer, CHI St. Luke’s Health-Memorial Livingston is now scheduling women for 3D mammogram exams – a first for the Polk County area. Utilizing advanced breast tomosynthesis – or 3D – technology, Hologic Genius™ 3D exams are clinically proven to significantly increase the detection of breast cancers, while simultaneously decreasing the number of women asked to return for additional testing. In conventional 2D mammography, overlapping tissue is a leading reason why small breast cancers may be missed and normal tissue may appear abnormal, leading to unnecessary callbacks. A 3D mammography exam includes a three-dimensional method of imaging that can greatly reduce the tissue overlap effect. During the 3D portion of the exam, an X-ray arm sweeps in a slight arc over the breast, taking multiple images. A computer then converts the images into a stack of thin layers, allowing the radiologist to review the breast tissue one layer at a time. A 3D mammography exam requires no additional compression and takes just a few seconds longer than a conventional 2D breast cancer screening exam. · A 41% increase in the detection of invasive breast cancers. · A 29% increase in the detection of all breast cancers. · A 15% decrease in women recalled for additional imaging. The mammography center at CHI St. Luke’s Health-Memorial Livingston has its own private waiting room and the technicians are all female. It’s a very thoughtful process so patients never feel exposed or uncomfortable. A new law, which goes into effect on September 1, mandates that all commercial insurance providers in Texas cover 3D mammograms. If you can’t afford a mammogram, please contact the Women’s Special Services department at CHI St. Luke’s Health-Memorial at 936-639-7066 for a 2-minute screening for eligibility or to schedule an appointment. Join us as we unveil our new 3D Mammography technology on Thursday, August 31 from 4 to 6 p.m., located in the Imaging Center at CHI St. Luke’s Health. If you would like to schedule a 3D mammography exam, or have questions about this important breast health procedure, please contact CHI St. Luke’s Health-Memorial Livingston at 936-329-8700. CLICK HERE TO VISIT CHI LIVINGSTON ONLINE!